The day Craig left, Karen flew in by floatplane from Seattle. She had a fun time flying up but I'll let her tell the story in her own post. Once she got to Nanaimo, we had lunch then shopped for provisions for the next part of the trip. Stocked with groceries and libations from the liquor store, we had a birthday dinner in town then turned in so we could get an early start the next day. 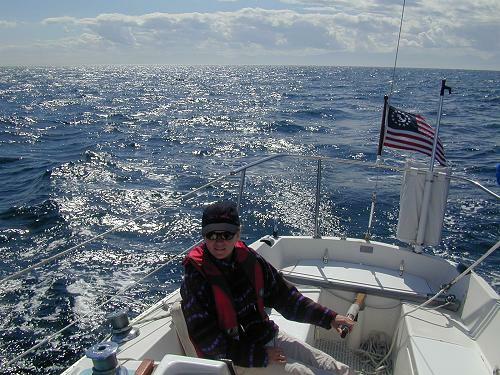 We awoke to perfect conditions - a southeast wind of about 12 knots, clear blue skies, and fairly calm seas. 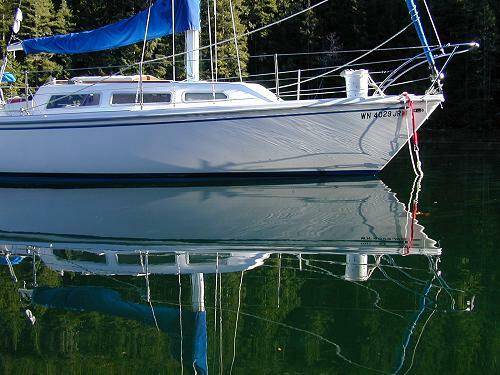 We raised the sails outside of Nanaimo Harbor and did a steady 7 knots on a beam reach all the way across the strait. This 20 mile crossing can be treacherous, but ours was picture perfect. 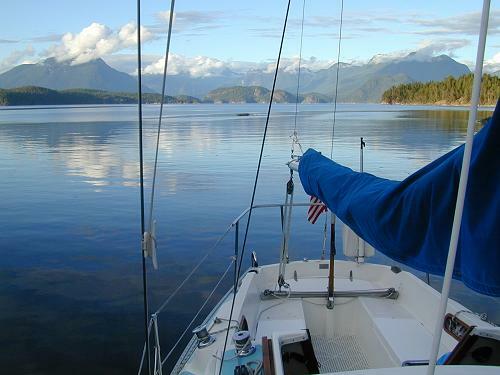 Once across the strait, we dropped anchor in Smuggler Cove - another wonderful B.C. marine park. 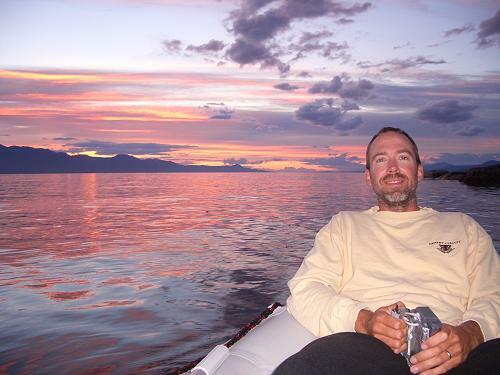 We explored the rocky peninsula, then paddled out in the dingy to catch the sunset. Here is a rare shot of me. Heading north from Smuggler Cove, we transited the Malaspina Strait between Texada Island and the mainland. This is another area known for sometimes foul weather. We saw rain - the hardest I'd seen so far on the trip - and sat under a tarp for a while to try to keep dry. 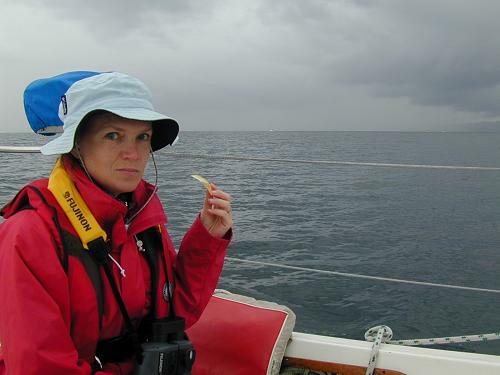 Here Karen looks a little dubious about the squall in the distance. Later in the day the weather cleared and the wind kicked up from the southeast pushing us north toward Grief Point and the southern reaches of the Desolation cruising grounds. After one last provisioning stop at Powell River, we continued north and in the early evening rounded Sarah Point into Desolation Sound. We made for the first anchorage we could find - Galley Bay. Having a beer after the hook was set, we toasted ourselves. 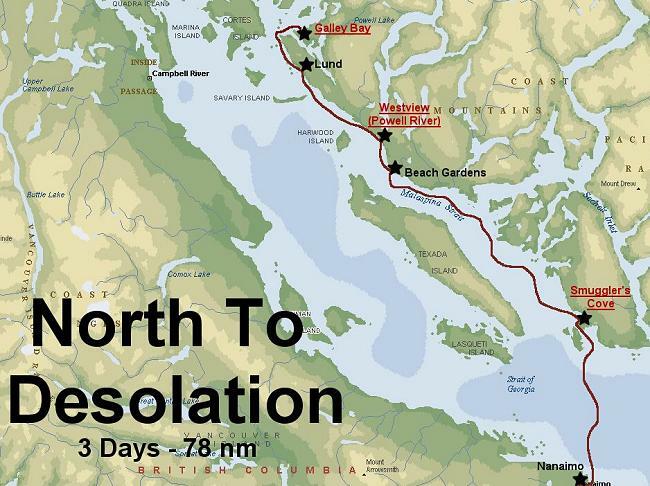 We had made 92 miles in 3 long days from Nanaimo and we now had the rest of Karen's break to relax in Desolation Sound. This was the view from that first anchorage the next morning. 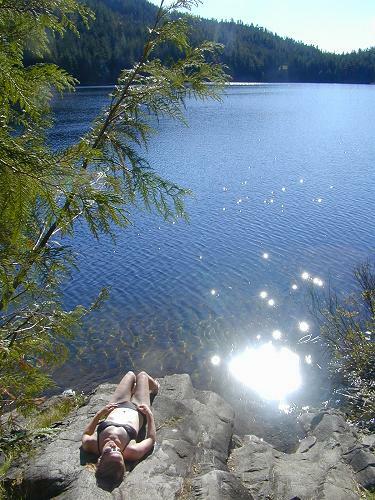 We had heard rumors of warm water swimming available in the sound, but we found those reports to be mostly exaggerated (at least for September). While the sound was fairly cold (~65 degrees F) the fresh water lakes were relatively warm. We found several lakes that were short hikes from our anchorages and we reveled in both the warm water swimming and the abundant sunshine. Here is another photo of a stern tie in Teakerne Arm. In this cove, the water is very deep. 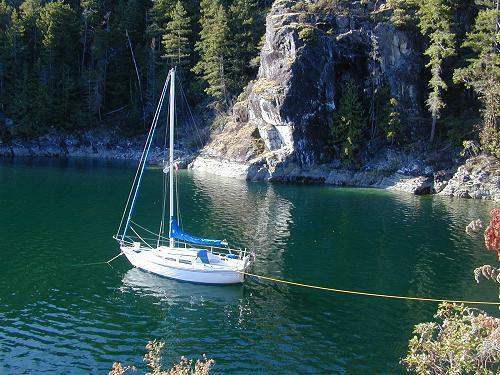 For a secure anchoring, you set your anchor out in the deep part of the cove then run a line back to the cliff. This holds the hook in one place and keeps you from swinging around. We did this enough times to become pretty proficient at it. Having Karen on board was wonderful. 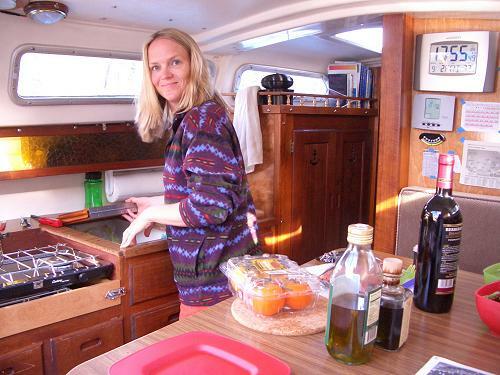 My wife is the perfect travel companion - we've had plenty of experience living in small spaces, she is a fantastic cook - especially with limited equipment, and she always has a good attitude. Here is a shot of us getting ready to smake dinner. Roscoe Bay was a beautiful, quiet cove. There was a strenuous hike to the top of a mountain, a fresh lake to swim in, and the anchorage was as still as glass. It was also full of moon jellyfish. Here is a shot I took from one of the kayaks. What you can't see are the hundreds of jellyfish right under the surface. A few days later we had an exciting sail in near gale conditions to Cortes Bay where we rode the storm out at the public dock. The next day we flew under shortened sails back to Lund to pick up our friends Eric and Sarah then headed back out into the most severe conditions so far on the trip. You'll read all about it in the next post.